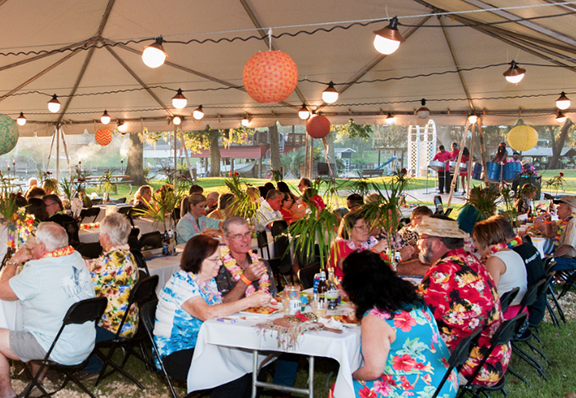 Weather control was achieved through positive mental attitude as it was picture perfect when a group of approximately 125 friends of the river dined on roasted pig under a huge party tent and listened to steel drum music at the Friends of the River San Bernard “Escape to the Tropics” fundraiser on Sat Oct 4, 2014. 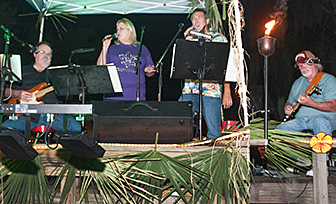 This was the first fundraiser held on the FOR Community Center grounds and successful enough to repeat in future years. 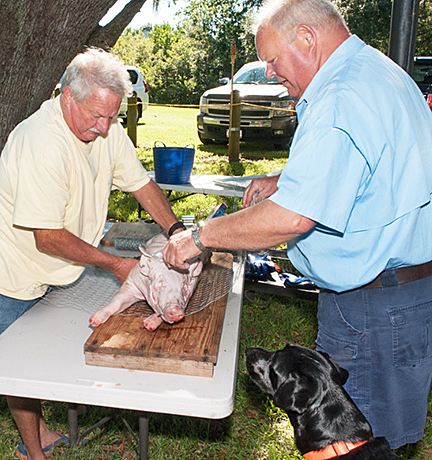 John Wallace, former FOR Director, on the right, assisted by Nelson Taylor, went whole hog and roasted two 40 lb. young pigs for the fundraiser. Here they prep the first pig, watched intently by Storm the Taylor’s black lab. The pig, before and after roasting. When done, the skin is dark golden brown and very crispy. It’s rather like how a person looks after spending a day in the Texas sun. 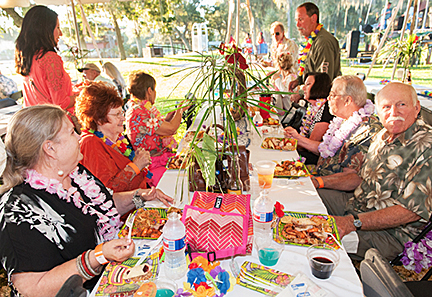 Colorful Hawaiian shirts and tropical wear lined the tables at the island party. Everyone who attended had a bright lei placed around their neck upon arrival. 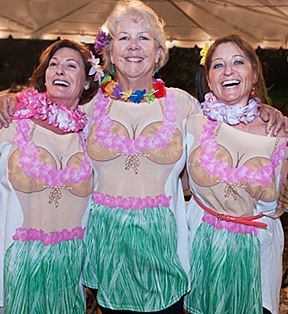 Sporting coconut bras, grass skirts and remarkable figures, even if they were printed on t-shirts, are fundraiser island girls, l., Ana Pogue, Claudia Pechacek and Sherrie Folger. 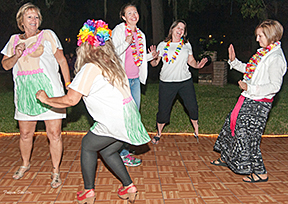 The fabulous night ended with party goers showing off their best moves on the outdoor dance floor groovin’ to the 60’s, 70’s, 80’s music of Vinyl Revival. See you next year!